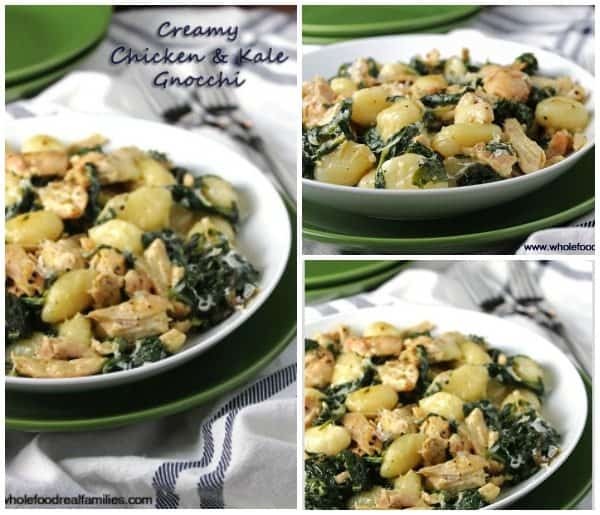 Creamy Chicken and Kale Gnocchi is a rich and delicious dinner recipe. You will never believe that it cooks so quickly. If you have leftover chicken from a previous meal, you’re halfway there! We often make this recipe after grilling chicken on the weekends. Toss a few extra chicken breasts on the grill and save the leftovers to simplify your cooking during the week. With three kids on three different drop off and pick up schedules at school, there are times I struggle to get dinner on the table. Yes, even as a food blogger, there are times that cooking takes a back seat to all of my other family obligations. One of the most helpful habits I have adopted is to cook ahead on the weekends. When we pull out the grill on the weekend, we always add a few extra pieces of chicken. 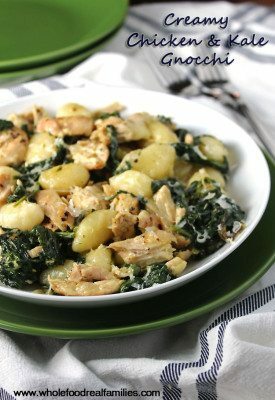 The leftovers turn into this Creamy Chicken and Kale Gnocchi. Don’t worry, if you don’t grill, this recipe works just as well with chicken baked in the oven. 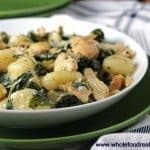 Potato gnocchi is one of my favorite pastas. So much so that my husband learned to make it from scratch just because it makes me happy. He is pretty awesome like that. But you can also buy gnocchi in any grocery store. It takes two minutes to cook – basically dropped in boiling water, when it floats it is done. If you like the idea of cooking ahead, you should also try this Pulled Pork Hash with Baked Eggs. It remakes your weekend pulled pork into a delicious weeknight dinner in just a few minutes. 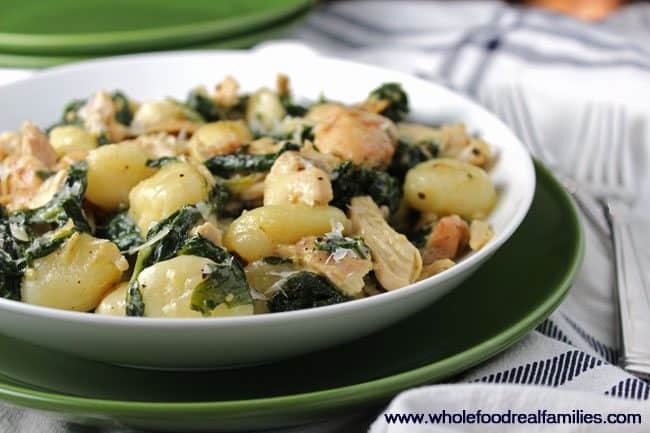 If you really like kale or at least want to like kale, this Creamy Chicken and Kale Gnocchi is a great place to start. I am a recovered kale hater. I spent the first few years of the kale phenomenon thinking the food community had lost its mind. Then I made this Awesome Sauteed Kale! It is really delicious and has turned my whole family into kale lovers, even my teenager. (I am still working on the little kids.) In an ironic twist, the kale recipe is the most visited recipe on my website, Whole Foods | Real Families. Among the best parts of cooking with greens like kale, spinach or chard is that they cook very fast. So they make are a great way to tie a meal together, especially during the week when time is hard to come by but everyone is still hungry. Garlicy Pasta with Sauteed Shrimp and Chard is one of our go-to meals for nights that are packed to tightly. It literally goes on the table in less than 20 minutes. If you are looking for more family meals that focus on fresh ingredients and simplifying your time in the kitchen, visit Cynthia at Whole Food | Real Families. Or follow me on Facebook, Pinterest, Instagram or Twitter. A rich and delicious recipe for dinner. You will never believe how quickly it goes from the stove to the table. Salt and pepper 1 pound of chicken and either grill or bake in the oven until done. (350 degrees for 23-26 minutes in the oven.) We usually do this step ahead by adding a couple of extra chicken breasts to the grill over the weekend. In a large saute pan, heat olive oil over medium heat. When oil is shimmering but not smoking, add shallots and cook 2 minutes until soft. Add minced garlic and cook for 1 minute stirring often to prevent burning. Add gnocchi and let it toast for a a few minutes in the pan, stirring often to prevent sticking. Add chicken and kale then stir to combine. Add chicken stock and cream, mix well and let it simmer until it thickens. Salt and pepper to taste. Serve warm and enjoy!